Brocaded Daffodils has been identified as being made by Imperial (not Fostoria, as previously reported). 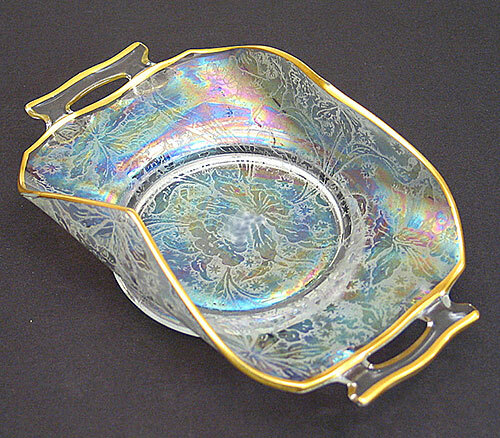 It was once assumed that all of the brocaded patterns were by one maker, but new information shows that there more than one company made brocaded patterns. 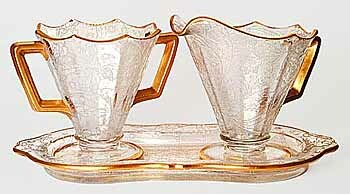 Shown above are a bonbon in white with gold trim and a creamer and sugar set with tray in white, also with gold trim. The creamer and sugar set is courtesy of Carl and Eunice Booker.